A lot has been said regarding the latest Apple TV commercial, “Misunderstood“. So much in fact, it seems futile to add another opinion. Nevertheless, it also seems the masses have neglected to make (the logical) comparison to Google’s recent advertisement, “Sick Dog“. Two well timed commercials, from the two largest competitors of the mobile devices space. Watching these ads back to back is a key visual illustration of what divides these companies and their users. Both ads feature the stereotypical slacker millennial, the type of kid that begs for a fist shake from a baby boomer. While the protagonists in both story lines are “missing out” on real life, look at the intent. Apple’s hero, perhaps a tortured artist, is diligently polishing an expression of his emotion. A trade off to create a lasting memento. Google’s hero is blowing off his mom to play video games. A temporarily pleasing and selfish act. So before or after the “end of ad” reveal, can viewers really align with a guy who disrespects his mother? Even the mob knows you gotta respect your mother. The latter comes off as malicious and cold. The former just introverted. Think about the absolute worst case scenario here. The Apple kid might miss out on a nice holiday weekend. At worst, this is depressing, possibly pitiful. Meanwhile, Google’s adorable dog Boomer could literally die. More so, the Google ad does nothing to indicate anything other than a bad outcome is awaiting Boomer. That’s morbid and for those who have ever dealt with loss, gut wrenchingly painful. In 90 seconds or less, a storyteller can more easily recover from mildly sad than the thought of demise. More importantly, if death is going to be casually thrown out as a possibility (which isn’t a great advertising tactic to begin with), the payoff should be that much grander. For several years now, an unofficial slogan of Apple could be “surprise and delight”. It has been a pillar of their philosophy, making appearances on stage, in internal memos and in press releases. This commercial is no exception. The payoff is the unexpected. Artfully spinning a negative perception into a positive experience (surprise). Combined with a heartfelt tribute to his family (delight). On the other hand, closing with “Made for What Matters”, Google insinuates their kid makes it home to see Boomer. Exactly the outcome we’d expect for someone in his position (no surprise) by achieving the status quo (no delight). This also begs the rhetorical question, is it difficult for middle class teens to get home in times of need? Putting aside all other noted complaints, we have two companies selling mobile devices here. Even by 2013 standards, both iPhone and Android devices have a plethora of features to highlight. Google takes this opportunity to show a device that can alert of a cancelled flight and assist with alternative directions. Apple’s device is shown shooting and editing HD video, then streaming the final piece to a nearby TV. Interestingly, my mobile device from 2007 has been able to assist in navigating major cities and back country without fail. Despite the various dissenting opinions floating around, the only fair comparison of Apple’s ad should be against its contemporaries. Not our idealized version of society. In light of this, there is one clear winner. What Color is Mac Pro? With all the hubbub over iPhone colors, the sparse discussion of the true Mac Pro color following yesterday’s announcement is surprising. Phil’s “anodized aluminum enclosure” statement artfully dodges specifics. The wonderfully CSS animated Apple marketing page would have me believe they anodized to a solid black, much like the retro iPod Classic. Yet Apple’s epic, slow motion assembly video indicates it might be a mirrored dark silver. Or dare I say, “Space Gray”? But then the hands on photos just adds to the confusion. So while a picture is worth a thousand words, I’d prefer a hex code, a Pantone Swatch or the word of a first hand observer. 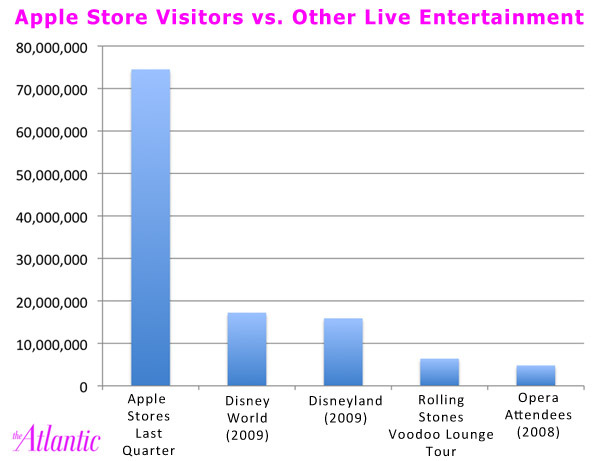 134 million visitors browsed the Online Apple Store in June 2011. Compare that to the 73.7 million that set foot into an Apple Retail Store in 2011 Q3. * based on monthly unique visitors.